Your presentations can now fit in a pocket - or your palm. Be PC-free: Project your content directly from a plugged-in USB drive, or SDâ„¢ Card, or even a smartphone. Show your ideas in HD quality by connecting via HDMIÂ® and MHLÂ® ports to HD source devices. Project wirelessly with the Acer eDisplay ProÂ® app. Text is crisp and graphics are clear even from far away, thanks to high contrast ratios. Your ideas will pop with the high brightness of LED technology, creating vibrant visuals and delivering consistent color saturation. 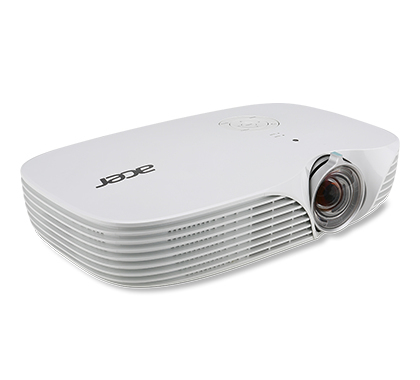 With Acer ColorSafe technology, those colors retain their natural look even after prolonged projector use. Selected models let you plug and play immediately by auto-detecting source signals and by being compatible with popular presentation software types. User interfaces are intuitive so you can concentrate on your thoughts, not your actions, and the quality of your presentations is enhanced with an integrated SRS speaker. Let your ideas and the planet both blossom. The longer lifespan of the LED lamp saves on replacement costs and combines with the deviceâ€™s Eco Mode to ensure a long projector lifetime. The absence of hazardous mercury or halogen gases means safer use, and a fan-less design keeps projector noise to a minimum.